A senior United Nations relief official today announced the release of $12 million from the Humanitarian Fund in Central African Republic (CAR) for 26 projects for national and international non-governmental organizations and UN agencies in the sub-Saharan country. “This second allocation within this year will enable rapid response to meet the urgent and critical humanitarian needs,” according to the relief official in the Central African Republic,” Fabrizio Hochschild, said in a statement released earlier today by the UN Office for the Coordination of Humanitarian Affairs (OCHA). The $12 million will fund projects covering various needs including health, the fight against malnutrition, education, water sanitation and hygiene (WASH), protection and logistics support to restore humanitarian access. The funds made available will also enable response to the needs of internally displaced persons (IDP), host vulnerable communities and to support the IDP return phase. Also, Hervé Ladsous, the Under-Secretary-General for UN Peacekeeping Operations, recently stressed the importance of the Donor Conference. Sustained international engagement had often been lacking in previous crises in the country, leading to relapse into violence. “While the primary responsibility rests with the Central Africans, we must ensure that this mistake is not repeated,” he stressed. 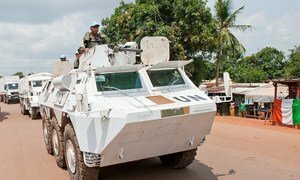 The United Nations peacekeeping mission in the Central African Republic (CAR) has reported that after a standoff with a convoy of heavily-armed men near Sibut, the capital of Kémo Prefecture, UN forces detained 10 of the suspects and recovered a “significant quantity” of weapons and munitions.